Nice look, and was easy to install. Found a matching oil rubbed bronze drain that looked great. The bowl is not overly deep or shallow so no issues with splashing. Handmade from solid tempered glass, the VIGO Mahogany Moon Glass Vessel Bathroom Sink is ideal for everyday use. The polished interior and textured exterior are stain-resistant and easy to clean. Infused with lustrous mahogany tones, the bathroom sink elevates the decor of any bathroom, whether it's in your master bath or the powder room. I was worried about buying these vessel sinks without actually being able to see & feel the quality, but I was pleasantly surprised that these sinks are even more awesome than pictured. Great value! 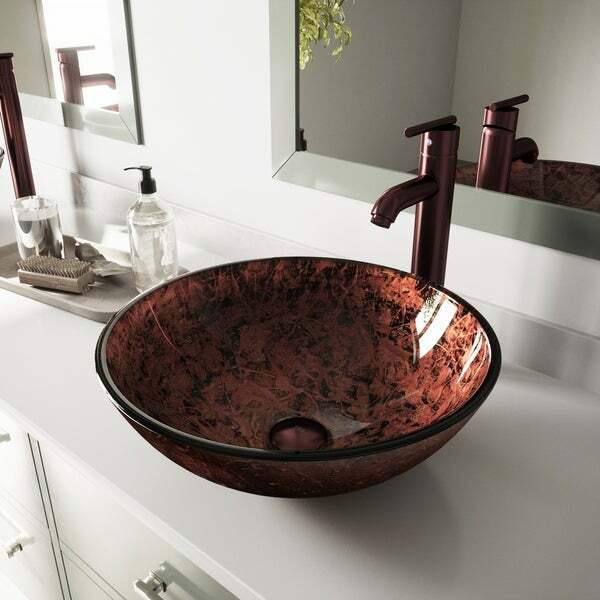 The sides of the sinks are very thick and the color is just beautiful, full of copper tones with a textured outside and shiny smooth inside. I bought oil rubbed bronze faucets, pop up drains, and a base mount which looks perfect with this sink. Very happy with my purchase and the quality of these vessels. Thanks Overstock! I had to return the first vessel because there was a defect in the vessel. Customer service was superb and sent a replacement within days. The second vessel is flawless. The two sinks are different in coloration; one was more reddish and the other more brownish, both beautiful though. The vessel has yellow flecks and reddish shimmering areas. Goes nicely with my yellow bathroom. I ordered 2 of these vessel sinks for our master bathroom and they exceeded our expectations. Pic does not do it justice! This sink is Gorgeous! The copper color is so rich and pairs great with my Oil rubbed bronze fixtures. It really pops on top of my black marble!!! Cant wait to install it.....if we ever finish this reno!!! Was also very well packaged. I am very happy with this sink. It looks great in my bathroom. I am beyond satisfied. It is beautiful and very easy to install. Beautiful sink. Great colors. Can’t wait to ha e it installed. This is a beautiful sink! I love this sink! I put it in a model home at The Great Big Home &amp; Garden Show in Cleveland in January of 2016. it got rave reviews. I was concerned this would be too red, but it's not red at all! Goes well with the new tile on the counter top. "Do these sinks come with the mounting rings?" Hello yaboni, we appreciate your inquiry. This item can be installed with or without a mounting ring. The mountain ring is not included. We hope this information has been helpful. Thank you for shopping with us. Have a great day!